In my first post in this series we revealed the documented facts about personal referrals. Simply, they are the most effective form of advertising for your business. In my next post, I laid out the four reasons why referrals traditionally have not scaled. In the third post, I introduced a mobile app called Referron that enables referrals to be made at any moment from any location with three easy clicks on your smartphone. Now I want to share best practices on how to add proper process with your network to turn Referron into the ultimate referral engine for you and your business. It takes the right balance of people, process and technology. The key to a good referral engine is engaging and connecting with the right people in your community. Seek professionals with common values, a reputation you trust and a product or service you would genuinely refer to your friends or family. More beneficial are professionals that fit this description AND are promoters of your business. This is your referral network and you should formalize and create a Referron Network Club (RNC) in your community. It is important to stay engaged with your RNC so that all club members are top of mind when business opportunities arise. A regular schedule of meetings with a structured format and varied agenda is the glue that will keep your RNC tight and solid for many years. Integrating thoughtful agenda topics to keep your meetings engaging and educational builds on top of the referrals and business growth. Your members organized into a unique Referron Mobile Group Folder. Referral activities within your RNC shared for tracking and reporting. the dollar amounts of closed business leads. Custom Mobile App private for your RNC community. Referral and etiqutte tips via push messages and videos. If you would like a free one hour consulting session to define how you can build a professional Referral Engine to benefit you and your community please contact me to set a date and time for an introductory call (dan@referron.com). The Connector - the maven in your community that Seekers turn to for advice. The source of the valuable referral. The Provider - the business that can best satisfy the Seeker as seen by the Connector. Now let me reiterate the four major reason why referrals don’t scale and introduce a mobile platform Referron a that solves for these problems and enable referrals to scale for your business like never before. The Dropped Ball. When a Seeker requests a reference from a Connector, the Connector must follow up at a later time to make a phone call, send an email or speak to the business Provider in person about the opportunity. Unfortunately this delay compromises close rates and sometimes means the referral never happens. With Referron the referral can be made on the spot and in front of the Seeker. Gone is the need to create and execute on a follow up action item. Introductions are flawless and meetings are more likely to occur. More meetings leads to more closed deals. The Single Connect. Often a Connector gives the Seeker information on the Provider but does NOT double connect back to the Provider with the contact details of the Seeker. There is no way for the Provider to track referrals they don’t realize occurred. With Referron both parties are introduced in a polished manner with a professional email that highlights all the information needed to move discussions forward. Referron delivers the double connect, the Provider too is given a referral with all the key contact information and a warm intro on his\her services. This leads to more discussions, which equals more new business accounts. Tracking. It can be cumbersome for a Business Provider to keep track of all referrals via traditional methods. Emails are lost in the inbox, slips can get misplaced, business cards are filed and forgotten and phone messages are separate all together. Receiving your referrals via Referron means you can store and track your referrals in one location securely in the cloud. Plus the leads all roll up to your group administrator to make preparing for meetings easier. Missed Thank You’s. Often a Provider never knows a referral was made (Problem #2 – Single Connect) and as a result after the business is closed they don’t properly thank the Connector. Sometimes they are aware who gave the referral but for one reason or another simply don’t follow up with common courtesy, a thank you, to inspire the Connector to make more referrals. Referron makes Thank You’s seamless and consistent by tracking and recognizing success. Referron is a platform that is scalable for your business needs. It combines mobile technology (Free on the App Store or Google Play) with an optional fee based business network web portal. Like any technology designed for a business it must be coupled with good people and strong processes. Referron by itself is a cool tool but connected to your network and coordinated with a business plan, it can be the key to unlock a stream of referrals to feed the top of your sales funnel. In my next post I will explain the best practices on creating a referral engine for your business by combining people, process and technology at a cost that will easily pay for itself with one or two closed referrals. Your business delivers excellent service and products yet you still do not get enough of the best possible leads - personal referrals. These leads have the fastest sales cycles, highest close rates and a proven proclivity towards more satisfied customers. In fact, customers that were referred to your business are far more likely to refer others and so on. So why don’t referrals scale more efficiently in todays business world? I see four major reasons. Your Net Promoters though well intentioned often drop the ball when they see an opportunity for your business. They may see a perfect chance to refer your business but typically they wait until they reach their office computer to send an email to both parties. During this time lag the referral “To do” either becomes de prioritized or forgotten. And sometimes by the time they make the referral the opportunity has passed as the seeker has found another provider. Another problem is what I will call the “Single Connect”. Our studies show that promoters will often refer you and your business but never communicate this referral back to you and your business. You are running blind and can’t track or follow up on a referral you never received. Poor tracking and internal processes can have an adverse impact on close rates It can be cumbersome for a business to keep track of all referrals via traditional methods. Emails are lost in the inbox, slips may get misplaced, business cards are filed and forgotten and phone messages are separate all together. Missed Thank You’s. Often a Provider never knows a referral was made (Problem #2 – Single Connect) and as a result after the business is closed they don’t properly thank the Promoter. Sometimes they are aware who gave the referral but for one reason or another simply don’t follow up with common courtesy, a thank you, to inspire the Promoter to make more referrals. Today’s mobile technology can help with these four problems. In my next post I will share details on how a mobile platform called Referron has solved these four problems. It has helped me scale referrals for my business and I want to refer this mobile app along with best practices to you. It's free to download onto your smartphone. In advance of my next blog post go ahead and download Referron from the App Store (iPhone) or Google Play (Android). Also take a moment to add a photo and complete your profile story. When people refer you using Referron this photo and story comprise the first impression and we all know the importance of a good first impression. The inventor of the the Net Promoter Score Fred Reichold simplified defining business excellence by asking customers one question. Would they promote your service or product to their friends or family based on a scale of 1-10? A score of a 9 or 10 is a promoter. If a promoter is your best customer than what is your next best customer? I believe it is the customer that was referred by a promoter. Personal referrals are the best marketing exposure for any business. Nielson Ratings indicate that a personal referral is the most trusted form of advertisement. 84% of people that receive a referral trust this marketing source of information and two out of three or 67% will act and buy. The numbers for trust and action go down significantly for sites like Angies List and even lower for advertising on social media platforms. What is a better place for leads? Ad’s on Facebook or referrals from your promoters? It’s quite simple, you see when a person puts their reputation on the line and refers you and your business they are placing there social capital at risk. What risk does a person have when they place an anonymous opinion onto Angie's List or Yelp? None. Referrals come from people that know, like and trust you and your business.They bring the highest close ratio of any sales leads. Strong businesses with value added products simply don’t get enough of these best possible leads. There are four reasons why personal referrals don’t scale. In my next post I will share with you these four reasons and in the post after that I will share an amazing way to utilize simple mobile technology to allow referrals to scale for your business. This 10 minute video will show you step by step how to export your LinkedIn connections and import them into Referron. According to Nielsen people are 10 times as likely to action a word of mouth referral as they are to messaging on social media. Word of Mouth marketing works, we all know it does, now is the time to stop talking about it and make it work for you. Here are some tips that we have learnt from our customers. You should turn your business personal. With marketing to your existing customers you should make them feel part of your business. Give them information that isn’t normally available in your general marketing. Inform them of new releases before you go to general release. By doing this you really build up the trust and credibility in your business. Keep in touch with your customers. “If your customers don’t think of you, they don’t talk about you”. Email marketing, social media posts, be out there and be relevant. Think outside the box, the web doesn’t have all the answers. Record customer videos and post these out there, it’s amazing how many people then point their friends to that video. Define a customer elevator pitch. At a company I was at several years ago, we had a pitch that we gave to customers. One day at a conference I overheard a user of our product talking to someone else and they used our pitch, “Brilliant”. The most important thing a referrer wants to hear, is that the person they referred had a great experience with your company. So whether you make the sale or not, really make the referred customer feel special and that because their friend is a part of the club they are now the latest member. I know some of you out there will say every new customer should be treated the same way. And yes you should always give great service, but people love to feel special and this is the time you should really work this. Think about the reward. More cash doesn’t always work. One of our customers changed a reward from $20 a referral to now giving out a sports bottle ($14). Her referrals went up 5x overnight. The reason, her customers said they felt uncomfortable getting cash, but a water bottle felt OK. Even better, her marketing is on the fancy water bottle. This water bottle is now becoming a topic of conversation with her customers and that is now creating a reason to stay “Top Of Mind”. Track Referrals so you understand who your best customers are. A Financial Advisor was telling me just today, one of his top customers has the smallest portfolio, but she has referred over a third of his business in the last 2 years. You can imagine how well she gets treated. But if he didn’t track and acknowledge this, then, if this small customer was to leave he might lose a far bigger chunk of his business than he was expecting. The first step in the design of your referral system is to unearth the simple, remarkable difference that is your chief competitive advantage. It’s not enough to offer a nice feature, something your competition doesn’t; this must be something so special that people can’t help talking about your business. End of discussion. If the core difference you offer doesn’t make people stop and take notice, you’ve still got work to do. Refer from facebook, linkedin contacts, phone contacts or new contacts, your favourites, your existing Referron connections or grops that you belong to. The activities button enables you to identify all activities that has occurred on your Referron account. For those of you who wish to manage referrals of a specific group, and enable members of a group to be connected with each other. Referron has the capability to manage and measure referrals on a company and group level. According to The Undercover Recruiter, employee referrals are the best source of hire. Nowadays it’s still about whom you know, and your current employees may already hold the key to the perfect candidate. It is becoming more common for recruiters and companies to hire the best qualified candidates through employee referrals. It is important to acknowledge that your employees can be a key resource for hiring potential candidates. Through their social networks they have access to friends and connections that could be a suitable fit for your new position. Just think about it, 10 employees with 150 friends or followers gives you access to 1500 contacts. Employee referrals can also save your business money on recruitment and staff turnover costs. Career sites and job boards have the highest number of applications compared to referrals and other sources. However, studies from online recruiting agency Jobvite shows that referrals have the highest conversion-to-hire rate. When it comes to hiring a new employee, timing is everything. Employees hired through a referral are hired 55% quicker than those who come through a career site. Additionally, these employees are likely to stay longer as they already feel a sense of connection and satisfaction to their new position. 60 people out of 100 are likely to take action from a friends recommendation compared to 25 for an email that somebody has signed up for. Text ads on mobile phones you are down to 4/100. In fact when we spoke to our customers their clients indicated that if they got a text ad not only would they not respond but they may avoid that brand in the future, so you have been warned. The takeaway I see here, is its clear you want to educate your customers and ensure that they have a great experience that they want to share with friends or talk about in social media. So business as usual. What's better than happy customers? Happy customers who tell all their friends about your brand. If your end goal was customer satisfaction, take a step back and try to imagine the next level: activating those customers to spread the word about your products and services. It's important to remember that most people will only go so far to promote your company, so you've got to make it easy for them to go that extra mile for you. 1. Turn receipts into customer feedback questionnaires. Your in-store purchase receipts are a guaranteed point-of-contact with most satisfied customers. Think about it: they've liked your products enough to buy them. Businesses around the world are getting wise to the opportunity to ask for customer feedback by printing details of their online surveys at the bottom, along with information about prize-draw giveaways for entering. UK's upmarket supermarket Waitrose, chocolatier Hotel Chocolat, and kitchenware store, Lakeland all give you the opportunity to enter fantastic prize draws for submitting feedback. But the experience can go further than this: Make the survey social with links to Facebook, Twitter, Google+ and other social media sites so that customers can spread the word about entering your promotions. 2. Get geo-social with Foursquare. Make it fun for your customers to share their shopping location with their friends by joining geo-social networks like Foursquare. Your customers are happy to be in your store, so give them the opportunity to check in and share their location with their networks. Starbucks has 1.5 million Likes on Foursquare, and check-ins can earn you badges and special promotions. The app is linked to other social networks, so when customers check in, it will show up to all their friends. With over 30 million people using Foursquare, it's a great way of helping happy customers tell all their friends where they are. Not only that, using Foursquare helps facilitate togetherness and a sense of community by showing who else is around to enjoy a cup of coffee in the neighborhood, which is an underlying mission of the company. 3. Create a feedback cycle. These days, online reviews are more powerful that advertising for persuading potential customers to purchase your products and services. In fact, according to Nielsen, 92 percent of consumers around the world say they trust earned media, such as recommendations from friends and family, above all other forms of advertising. If your end goal was selling your product to a customer, think about adding an extra step and contacting customers for reviews. Often when people are buying online, whether it is for physical goods, virtual goods, hotels or flights, they will provide their email address. An email list is a powerful marketing tool, so be sure to send a follow-up email asking for feedback and linking to sites like Amazon or Trip Advisor to make it easy for customers to post reviews. The simpler you can make this process, the more likely it is that customers will review your company online. 4. Go mobile with a socially-activated app. Customers can be hugely creative with apps like Instagram, so why not encourage and reward their creativity? Clothing companyFree People is leading the way when it comes to community-building. They encourage their fans to upload their Instagram photos of how they style their favorite Free People items, and upload it to the "Add a style pic" button against the item on their website. This gives customers a great idea of how the item looks in real life, as well as building a whole community around style and fashion, with "likes" shown as hearts. Fans can build and share their own collections with the community, thus becoming an organic marketing army for the business. Has anyone not heard of Amazon? We know they are the global leader in e-commerce, but that doesn't stop them from socializing their online ordering process to let customers tell their networks about their purchases. They make it simple for customers to share their purchase information with their networks on Facebook and Twitter, or by email, effectively recommending it to their friends. If Amazon isn't complacent about asking their customers to tell their friends about their shopping experience, can you afford to be? 6. Display your business's social properties with pride. One of the best ways to ensure your current customers become a part of your communities and engage with you is to make it super easy for them to find your social properties online. Customer satisfaction should be the number one priority for your brand, so encourage feedback and be prepared to act on that feedback, whether it is positive or negative. Empowering your customers with the ability to share their opinions on your brand requires a leap of faith. But if you trust in your brand, helping customers spread the word about your products can be the most powerful marketing tool you ever use. People should only give referrals (referron) to people they know, like and trust. We all know how effective and inexpensive word of mouth marketing can be compared with other more direct forms of marketing. Word of mouth referrals are three time winners - the conversion rate is much higher, the time to decision is shorter and the asking price is less significant. We should do everything we can to maximize the number of these referrals and these six open secrets will help you do just that. You must identify, cultivate and reward your champions. Not all of your customers will become your champions so you need to identify the mavens, the trusted experts in your line of business. These are the people who their friends will turn to when they want advice or help. You should cultivate these champions by invitations to special events, pre-release of product news, discount vouchers for them to give to their friends. When you receive referrals from your champions they could be rewarded by cash, discount vouchers or gifts and never forget to say 'thank you'. Just a simple 'thank you' has been shown to more than double referral rates. Engage in the conversation. Place offers and news on Facebook. The value of 'likes' is not significant, people click the 'like' button far too readily. Customers are looking here for more substantial reviews and testimonials. It's a good place for product announcements as news will spread very quickly. Do you have visually appealing products, do people photograph them and share the images with friends? If so, Pinterest is a good place for you to publicize your products. For example, we ran a trial program for a pastry supplier which showed a customer's photo of one of their pastries. Viewers were offered a discount on this pastry if they took the photo into the shop. This increased customer traffic by more than 20%. Can be just a lot of noise but often industry mavens or bloggers will pick up generic hashtags and may start talking about your service. Customers are getting more used to searching here when researching a product. A network focused on professionals and business opportunities. You should join and create a group around your product. It is another good place to post news and product announcements. If you have any travel related business, this is the number one spot to influence people. It's reached the point that bad reviews or too few good reviews can break a business. Tripadvisor still has some shortcomings but is generally more reliable than many other social WOM sites. You should encourage your customers to post reviews on Amazon. The most effective way to do this is by sending a personal email to each of them asking them to post a review. When reviews are posted, respond to each one and don't forget that a 'thank you' can double the referral rate. Most products only get a few reviews so following up these reviews this should not be an onerous task. This is another place to encourage your customers to post their reviews. This tends to be focused on restaurant reviews but we are seeing an increasing number of other business services being reviewed here. It's important that you encourage activity on Google+. Google uses this activity for improving search rankings. You need to get into double figures here before people feel there are enough good reviews to act. However, you must be careful about trying artificially to generate lots of good reviews as Google are continually watching for people abusing the system. An example of this was some car dealers in the US were helping their customers to write complimentary Google+ reviews in their showroom. This created a large number of reviews very quickly but Google then punished them for this abuse by deleting their ratings. We can debate whether this was a fair response by Google but it does emphasize the point that reviewers need to talk naturally about your product or service. Many of your customers may be acting, unprompted, as your champions and referring their friends to you. However, a referral program will harness their goodwill by formalizing this process enabling you to incentivize your champions to make even more referrals and to identify more champions from your customer base. How do you buy things, who do you trust for recommendations and then think how your customers will buy your products. Think about the context in which your customers will use your products. Your champions will usually talk about your product or service in context when they are describing its benefits and uses. Try and find incentives for both your champions and their friends that relate to the context in which they use your product e.g. a free bottle opener with each case of wine, a free 12 month warranty with each new phone. Whatever size of business you run, impeccable customer service is a must. Always respond quickly to all customers even if it's only to acknowledge the contact and to say that you will follow up later. Most companies have a Customer Relationship Management (CRM) system for tracking the sales process but often neglect to use it for tracking customer complaints or questions. The owner of one small business always booked time in his calendar to answer customer questions so that all were answered promptly. In contrast, another small business simply filed the questions in a folder and responded to the customers that shouted loudest. In the long run, this didn't save the customer much effort but lost lots of goodwill. Be open and truthful with your customers and your champions. If something is going wrong, acknowledge it and let them know what action you are taking to resolve it. The rumour is often far more damaging than the truth so it's far better that they find out about a problem from you before they come across it themselves. Even Apple have got this wrong several times and it has hurt their brand. Referron Sponsoring SME's to attend a 2 day seminar with the Industry Rockstars! Last month we launched an exciting new smartphone app called Referron, an app that enables you to refer to and get referred by someone you know , like and trust within 3 taps of your phone, with the ability to track and reward your referrals! It's been a whirlwind since then, with Referron taking the market by storm - mostly because it's the missing link for any business that gets sales through word-of-mouth referrals (and that means just about EVERY business) by making it really easy for your customers to refer your service to every contact in their phone... yes, you read that right, every contact in your customer's phone. Imagine what a difference that kind of referral power could make to your bottom line! Now I've got some more great news for you... and it includes a Free Gift to you valued at $147. Naturally, I want to help people using Referron to be as successful as possible, and the best way to raise awareness of the app is to have users talking about how much business they've been able to bring in by using it. That's why we've decided to sponsor some unique business workshops around the country over the next few weeks. Kane Minkus is a serial entrepreneur who has launched 5 multi-million dollar businesses, all in different industries. He made each one successful through networking, personal branding and building a high profile within the industry. Kane is in Australia to teach you these same strategies... because, with the right personal brand and profile, new clients and business opportunities will seek you out rather than you always needing to chase them. Tickets to these 2 day workshops were discounted to $47 each, however, thanks to our sponsorship of the event, you can now book in at no charge. In addition to learning the most cutting-edge strategies for personal branding, these workshops are an ideal environment for networking to find new business. You'll be in a room with a couple of hundred like minded businesspeople, who all understand the value of referrals to generate sales. Spend some time networking, and I guarantee you'll make some valuable contacts to find new business. This is the perfect place to use Referron for generating new sales; make sure it’s installed on your phone before you attend. Click here to connect with me, Upload your profile and download the app. So grab a seat now, as my guest, the first event is less than a week away! You know WHY, now let me tell you HOW! You may not always see one of these when you want to, but you'll always have Referron when you need to make a referral. Wherever you look, you'll find a multitude of reports and articles telling you how Employee Referrals are the best thing since sliced bread. It's hard to disagree with such an avalanche of evidence showing that Employee Referrals closely follow Motherhood and Apple Pie as self-evidently desirable. I'm sure that we all know the why of Employee Referrals backwards but what about the how? If they are so good for business, surely no-one wants their employees to miss a single opportunity to make a referral, all that's needed is the how! Enter stage left 'Referron'. This phone app gives all your employees the opportunity to refer any of their friends to your business anytime, anywhere. Immediacy is the business gospel today and Referron provides exactly that. Simply by using their phones, your employees can send you referrals at the very moment they are recommending your business to their friends. Sigmund Freud called it the pleasure principle of 'I want it and I want it now', I call it the Referron business principle of 'I want my referrals and I want them now'! Referron, available on the Apple App Store and the Google Play Store, is an app that connects with and empowers the champions of your business to send referrals anytime, anywhere. Sydney, Australia - 7 June 2013 - During their official launch at CeBIT Australia last week, The Referron app had over 300 technology innovators making referrals to each other over the three-day conference. Referron has been identified as the missing tool for every business that relies on word-of-mouth referrals. Using the smartphone app, just a few taps are all that's needed for the champions to send their friends as qualified prospects to businesses they know, like and trust. Early customers using the app are seeing 3-5x increase in referrals. Todd Heslin, co-founder and Referron architect, says, "CeBIT was the perfect example of people connecting with people. We didn’t need to sell Referron. We simply gave our customers the keys to test drive a new way of connecting with their champions." Whilst Todd and the Referron team kept the stand busy, most new customers were spreading the app from person to person. One advocate at the show proclaimed that referron is the social referral revolution! The app is free for anyone to download and begin referring, those who receive referrals can receive three free per month. Businesses can subscribe to unlimited referrals and online management tools for as little as $20 per month. Planned developments for Referron over the next few months include new social networking integration, messaging and business CRM integration. Referron is an Australian mobile startup based in Sydney, NSW and Boston, MA. Founded in early 2012 by Ivan Kaye and Todd Heslin, the team set out with the goal of making it easy for anyone to make referrals to businesses they know, like and trust at anytime, anywhere. 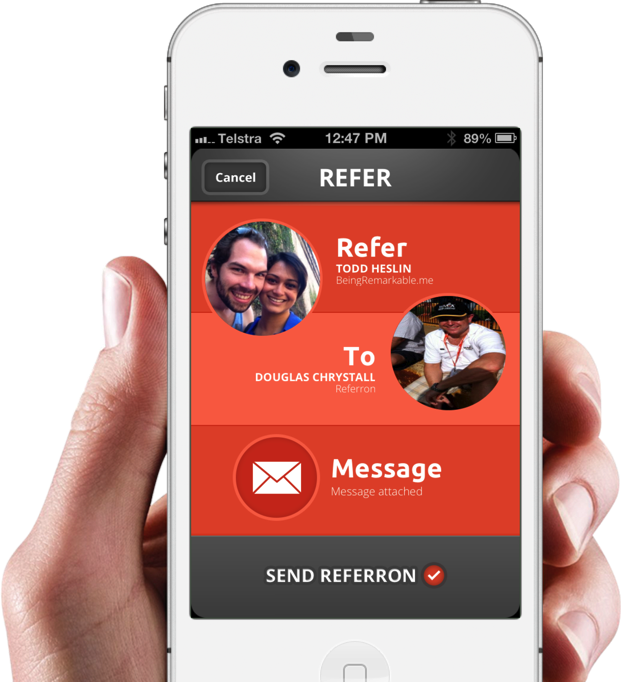 Sydney, Australia - 30 May 2013 - Referron has today completed the official launch of its flagship mobile referrals application. Identified as the missing tool for every business that relies on word-of-mouth referrals, Referron directly connects businesses with their champions - those people who enthusiastically support and endorse their products and services. Todd Heslin, co-founder and Referron architect, says, "Referrals have kept people connected for thousands of years. With the recent move to faceless digital messaging, Referron uses technology to leverage the humanity of connecting with people face-to face." The idea was the result of a need of co-founder Ivan Kaye to track referrals within his BSI Group of companies. Using the smartphone app, just a few taps are all that's needed for the champions to send their friends as qualified prospects to businesses they know, like and trust. Early customers using the app are seeing 3-5x increase in referrals. Referron has been exhibiting at the CeBIT Technology Conference at the Sydney Convention and Exhibition Centre on Darling Harbour with Technology Partner Prakash Software Solutions Pvt Ltd, based in Gujarat, India. After successfully building the prototype in Australia, Referron engaged Prakash to speed up the development process using its highly skilled and cost-effective team. Prakash Software is a leading software development business based in Gujarat, India. The team is highly skilled in open source systems such as PHP, Drupal, Joomla, WordPress, Zend and Code Igniter. Prakash Software also have extensive experience of the Microsoft Platforms of ASP.NET, Share Point Server, Telerik, Microsoft Dynamics CRM, Silverlight, MVC, WCF and WPF.